Over the hump: the Camel Cup finish line (photo: Jennifer Pinkerton). The Alice Springs Camel Cup race is one of the most bizarre events on the outback calendar. Jennifer Pinkerton meets characters as authentically Australian as they come, after defeating a bout of first-day shyness. A flush of gold light thaws the shoulders of Alice Springs’ MacDonnell Ranges. I open my eyes. Ring-necked parrots dip beneath clouds. The pool filter spasms to life, then hums bass like a monk. It’s time to get up. But I don’t feel like it. Not yet. The shyness. It’s become a handbrake during times I travel alone. While most wouldn’t pick it from the outside, the bare-faced truth is this: my first day someplace new can be pockmarked with anxiety. An exercise in feeling adrift. This time, however, a single day is all I’ve got. I’m in Central Australia for one, slightly odd, reason: the Alice Springs Camel Cup. 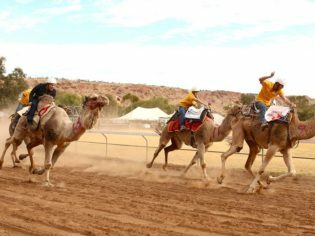 Beware the racing camels, Camel Cup, Alice Springs (photo: Jennifer Pinkerton). It’s held on a winter Saturday at Blatherskite Park showground, five kilometres from Alice Springs‘ CBD – and a butcher bird’s flight from the mountains surrounding town. The cup is a decades-old tradition. Around 20 camels and their riders travel from farms around the region and race eight heats, leading up to a finale. But the event is more than a competition. It’s a carnival. An eccentric one at that. Camel Cup judges in fancy dress (photo: Jennifer Pinkerton). By mid-morning, I’m loitering around park perimeters in my best denim frock. Utes, campervans and trailers clog either side of the Stuart Highway. They’re parked six rows deep. Grey nomads form part of the patchwork, too. In the early bird, front row parking bays I spy a van with the words ‘The Wrinklies’ splashed above its windscreen. Inside, ribbons fly through a royal blue sky. Children bounce on inflated castles. A backpacker couple kiss like no one’s watching. This 4500-strong crowd is a knitted blanket of bushies, tourists, families and friends. Men limber by in chequered shirts and chewed-out Akubras. Ladies do the same in a stream of glittering cowgirl hats. A small band of locals wed glamour with practicality by affixing fascinators to woollen headbands – though at 20-something degrees, it’s nowhere close to freezing. The next generation: Camel Cup, Alice Springs (photo: Jennifer Pinkerton). I cut a path past the food stalls. Each trades in a sole, simple cuisine. Baked potatoes. Hotdogs. Strawberries and cream. At the ‘business end’ of the park, a judge’s box stands on stilts. From it, four women descend in Arabian robes, merrily divulging the fact their jobs are far from strenuous. It’s usually clear which camel comes first, they say; this race is not marked by neck-and-neck ties. Horse racing might be an elegant affair – at least until the stilettos fall off after too many champagnes – but camel racing is altogether different. Horses, for the most part, behave. They’re predictable. Camels are anything but. “I’ve been kicked by a camel, stood on by a camel and I’ve held on for dear life,” I overhear one competitor confess. Remind me again why they do this? Here are the facts I’ve pre-packed. Hailing from Afghanistan, Arabia and India, camels were brought to Australia in the 1800s. They provided less water-dependent transport for the exploration and establishment of communications routes. But when trains finally arrived, the camels were no longer needed. Most were set free in the wild – despite the resulting environmental headache. ‘Wild’, too, defines their nature. Two handlers with their hardy camels in the Australian outback (photo: State Library of South Australia). A visit to the camel-holding pen illustrates this point. Here the animals grunt, spit and make groaning sounds deeper than Barry White ballads. It’s a bevy of unruliness. And this is all before the start gun fires – which will be a task for the start marshal whose real name, incidentally, is Graeme Marshall. The quirks don’t stop there. In fact, they seem to flow all morning. By midday, six camels enter the field. A flock of galahs squawk their support. Again, the start-line is chaos. Traditionally, camels begin the race from a seated position. At least that’s the theory. Readying rider and camel for the Camel Cup (photo: Jennifer Pinkerton). In truth, they’re all over the shop. I notice an exotic-looking bystander calling instructions through the fence. As competitors struggle to lower their animals, she shouts: “Put your foot down!” I’ve no clue what she means, of course. Nor do I feel able to ask – I still feel out of place. Once away, gangly legs wobble. Dust plumes on the track. “Tony, you’re going the wrong way!” someone yells to ‘Tony the Taxi Driver’ who’s galloping in the opposite direction. Turns out Tony isn’t so much driving as he is gripping on for survival. This is one crazy soup of a race. As far as the earliest of races go, the Camel Cup’s inaugural run occurred in 1970. The yarn is that two feuding mates, Noel Fullerton and Keith Mooney-Smith, wished to settle a bet. So they pitted their camels against each other in a duel beside the Todd River. This rambunctious race has run every year since. But with so many participants, it needed to upscale. As well as the camel race, the day includes belly dancing, kids’ rides and an animal farm. There are also wagon runs and ‘fashions on the field’. Today’s winner of the latter, Ruth Allan from NSW, symbolises one of the ways the cup has changed from its humble beginnings. While this was once a community event, today it attracts visitors from right across the map. Ruth came to Alice for a spontaneous weekend with friends. Interviewed by judge Tahan Lew-Fatt, a part-Malaysian, part-Aboriginal Territorian and former Big Brother contestant, Ruth explains that her outfit, a matching floral-print suit, was last worn on a Star Cruises ship in the ’80s. I leave the fashionistas to make my way back to the track. A piece of the puzzle slips into place: I see that camels spell adventure. I see, too, that the race is fun for riders. It’s an act of endurance, like riding a bucking bull. But what about the crowd-goers, what’s in it for them? To find out, I’ll have to beat the shyness. I feel my stomach tighten as I pass visitors lounging on blankets and chairs. There she is. The exotic woman I’d seen calling out through the fence. She’s with her daughter, chatting arm-in-arm. I know that I just need to leap. “G’day,” I say. “I heard you speaking to the racers before. You seem to know what you’re talking about.” She blinks: “Who me?” She seems more nervous than I must do. Yes, I nod. You. “I’d love to hear your story.” She broadcasts a smile, then fixes her eyes on her jacket. Rosalind Fulwood, descendant of Afghan cameleers (photo: Jennifer Pinkerton). “My name is Rosalind, and my maiden name is Fazulla. I am a descendant of the Afghan cameleers who came to Australia many years ago.” I feel my stomach tighten again, but not with anxiety this time. It’s a feeling akin to relief, laced with a surge of delight. “My grandfather on my father’s side is Fazulla Zaidulla. He lived in Broken Hill. My grandfather on my mother’s side is Akbar Khan. His father was Rameth Khan and they grew up in the Oodnadatta area,” she says. Strands of cropped hair catch in the wind. She lifts her eyes and giggles. Explaining why she treasures the cup, Rosalind speaks of the camel’s special beauty. “Their rolling, swaying gait is so unusual,” she says, “it’s why they’re tagged ‘ships of the desert.’” Plus, each camel is loaded with character. They’ve got personality in spades, she believes. I pinch myself. I can’t believe my luck. Rosalind brings to Alice Springs the spirit and inherited wisdom of old Afghan cameleers. She puts the cup in context, revealing that just below its skin sits a deep network of veins, connecting little-known lines of history. Heats pass. Hotdogs sell. Then, finally, as a last whoosh of hooves and dust ploughs to the finish line, we have a winner. But she couldn’t look more unlike a weather-beaten camel handler if she tried. Hannah Purss, Camel Cup winner, with her camel Roman Ruma Ruma (photo: Jennifer Pinkerton). A slew of camel farm jobs later, she won her first cup last year – making today’s victory a back-to-back win. Hannah kisses her camel ‘Roman Ruma Ruma’ for the cameras as Evan beams beside her. They look as proud as desert plum punch. As wind-down musician Fat Boy Slim Dusty takes to the speakers, I spy Ruth from ‘fashions on the field’. She’s already on the slip, sashaying down the ghost gum-studded trail that ushers visitors from the park. I note she’s still wearing her winner’s ribbon over the floral two-piece. Hannah, too, flits by. She’s holding her trophy tight. While this was once a men’s event, women surely steal today’s show. They judge, they win and they best tell the stories. Provided we pluck up the courage to ask for them, and conquer our own brand of shyness. A second time, I pass Rosalind. We trade details, then part ways – jointly tickled pink over having shared tales. Like a rusty hinge in the breeze, I hear a camel moan melody behind me. It’s time to go. But I don’t feel like it. Not yet. Getting there: Qantas operates direct daily flights to Alice Springs from Sydney, Adelaide, Melbourne, Darwin and Perth. Staying there: Lasseters is just a six-minute drive from Blatherskite Park, beneath the MacDonnell Ranges, on the banks of the Todd River. It has comfortable accommodation ranging from standard rooms to premium two-bedroom suites . There’s also four restaurants, three bars, a heated pool and spa. Need to know: The Alice Springs Camel Cup is held every year in mid July. I love this article, of course I am the “Exotic Woman” featured, but it brings back so many beautiful memories. I have had a long journey since then and that particular trip was the beginning of it all, I have my daughter still in the NT and 2 daughters in SA. I have a copy of this magazine and will keep a look out for others. I lo9ve the way the article is written and I hope to come across the young journalist again one day. Maybe I could help her with another story. Cheers Ros.